Osaka | this is what I never expected to do. Whenever I hear “We are Young” by Fun I think of a particular night in Osaka, a year and a half ago, when I had gone to see Woody Allen’s “Midnight in Paris” on my own. It was sometime on the weekend and it must’ve been in the midst of rainy season. The movie had finished, and I loved it. I wandered out of the theatre, texting my boyfriend to say that it was over. He was on his way to meet me. As I left the comfort of inside, I found a dry spot to sit down to wait. I sat, captivated by pouring rain, lit up by the glow of the little, blue-white lights. “We are Young” was playing in the background. Living in Japan, I wasn’t aware of a lot of new music, and by then, the song had already been out for some time. I recognized it from hearing the Glee rendition over brunch at Summer’s flat one Sunday morning. And when I think back to sitting there, watching the rain, listening to that song, Japan becomes some kind of personal Neverland. I won’t ruin the metaphor with detail. London has felt like an arranged marriage so far – one that hasn’t yet moved beyond the early stages of mild discomfort and vague curiosity. An arrangement of practicality, involving very little emotion. I have faith, however, that over time, I will find things to love about England. I remind myself regularly that as with any large city, this is not indicative of the character and culture of the rest of the country. I haven’t ventured to many places around England yet, but I’ve read about the Lake District, Oxford, Dover, and a handful of other places that I’ve dreamt of visiting since my studies in literature at University. We will get to know each other and become closer for it, I hope. It’s difficult not to compare this place to Osaka. To Kozu 3-Chome. To Kansai. What convenience, being able to cycle anywhere in the city within a reasonable amount of time, without the mad drivers of London threatening to knock me over! What excitement, knowing that most of the country is accessible via prompt, frequently running, relatively inexpensive trains! What wonder, living in a culture so far removed from the one with which I am most familiar! I have no doubt that my memory is skewed and that my image of Japan has become increasingly idealistic since I left. Knowing that, however, doesn’t make it any easier to think of the plum blossoms at Osaka Castle, probably on the brink of emerging, and me, not there to see them. I would venture out of London this weekend to get to know England better, but I’m afraid a large amount of it is underwater, or being blown away. I’ve gotten horribly out of practice with this blog-writing stuff. I secretly want to blame my family and friends back home for not nagging me to write more often, but I know it’s not their responsibility. It’s just that things here happen so fast and before I have time to write about this or that, the next thing is happening already and I’m distracted all over again by interesting, usually new things! I went to Tokyo last week for four days. Well, one of those days was spent mostly in transit from Osaka to Tokyo (there’s a slow Shinkansen that gets you between the cities in just under 4 hours for 10 000 yen, as opposed to 2.5 hours for 15 000 yen – which is what we took), and then from Tokyo out to our hostel for the night, near Mount Fuji (approx. 3 hours away by not-so-special trains). It was a great hostel – comfortable, spacious, tatami flooring in the dorm rooms (which had seven or so beds), good air con, nice bathing facilities, and a good view of Fuji on a clear day (ours was a cloudy day). Our first full day of adventure began at Fuji-Q Highland, which is one of Japan’s best amusement parks, with four awesome roller coasters, a fantastic haunted hospital attraction, Evangellion World, Gundam World, and an assortment of other delights. Our priorities were the roller coasters and the haunted hospital. They were brilliant. I’m not sure exactly what they are, but Fuji-Q boasts some world records for roller coasters. It was a full day. Tickets for the park are comparable to those in North America, costing around 5000 yen ($50) for a full day pass, but we got ours a bit cheaper by purchasing them beforehand at a convenience store (for 3500 yen). On the long train ride back into Tokyo to our hostel in Asakusa, we had an incident involving moths about which I was less than pleased. A giant orange moth, about as big as my two hands put together, decided to get on the train while it was stopped at some non-descript station. I hid behind Bel, who was to my right, as the moth flew around terrorizing other passengers, who consequently gave up their seats and ran to the other end of the car, or to another car. Thomas, however, shining knight that he is, protected everyone when, wielding a shiny, plastic bag, he captured the fiend. He spared its life, releasing it out into the wild at the next train stop. Another similarly colored and sized moth took its place immediately after, entering a different door; another rescue ensued. Not a half hour later, I was violently attacked by another, smaller, darker moth and saved by Bel. At the same time, Daniel – who was meeting us in Tokyo – rang me, and I could hardly talk. I’m lucky to be alive today. The next morning we visited the Studio Ghibli Museum, which is about 30 or 40 minutes out of central Tokyo by train. For only 1000 yen, it is a beautiful museum. The inside is spacious and seems like something from a Ghibli movie. You can see lots of neat little scenes from the movies, presented through an assortment of media, and it’s all quite magical. Towards the end of your walk through the museum, you can go on the roof via a little twisty staircase to see a life size replica of the robot from Laputa. The gift shop and book shops were impressive, and after perusing them, we sat outside at the cafe and had beer, which seemed to have been made specifically for the museum, being decorated with lovely Ghibli-esque labels. It’s definitely worth checking out, and far more accessible than my favourite museum in Japan (The Little Prince Museum, in the mountains in Hakone). Revisiting Tokyo was interesting. I’ve visited a lot of places in Japan that I don’t imagine I’ll revisit, at least not during this part of my life. I really enjoy that feeling of return and familiarity, though. I experienced it upon going to Hiroshima for a second time last year in August, and when I went back to Koya-san last fall. You notice different things, things feel different. Different seasons also bring about a different perspective. Tokyo seemed a lot shinier the first time around. Going back, though, reminded me that a lot of it is famous for shopping – particular with regards to fashion and electronics. So, I wasn’t in such a rush this time to see things. I revisited a couple of areas, such as the shrine in Asakusa, and went to a couple new areas like the Mori Art Museum in Roppongi (which was featuring an exhibition of modern Arab art, with the purpose of challenging Japanese perspectives of the Arab world), and a lovely little vegan restaurant in Shibuya, where we caught up with a couple of former Osaka-based English teachers. Compared to my friends, my trip was cut short as I had to return to Osaka to perform in an ABBA themed improv show with the Pirates of the Dotombori on Sunday night. I didn’t feel that it was too much of a loss, however, as Sunday in Tokyo was all rain and too many umbrellas. The show was relatively short and sweet, high energy, and lucky to have a responsive crowd. I held the fourth poetry event last week on Sunday. While there weren’t as many people reading as I would’ve liked, the turnout was brilliant, with around thirty people coming out. And this time, rather than it being only people I know, there were a handful of others who I didn’t know. The limerick writing contest at the end was really fun and included limericks in English, Japanese, and Russian. I’m really excited to see if I keep this up. I’ll need to put more work into having a solid list of readers lined up for the next one, but hopefully that won’t be too hard. If anyone’s reading this who came out, many thanks! And to anyone who’s reading this who lives in Osaka or nearby, come on out to the next one! I’ll be planning the next event for mid-April, probably. To be honest, I didn’t really hunt that much. We had a meeting with a housing agent on Thursday, she told us about a few potential options, drove us to see the most promising apartment, we liked it, we took it, we’re figuring out the details of the contract on Wednesday. Could we have found a larger space for the same rent? Could we have found the same amount of space for less? Quite possibly. But neither of us felt like dragging this out and looking around a lot, and the location we found is hard to top in terms of convenience. Instead of being rather south, I’ll be in a more central area, close to three subway lines and a major train line. 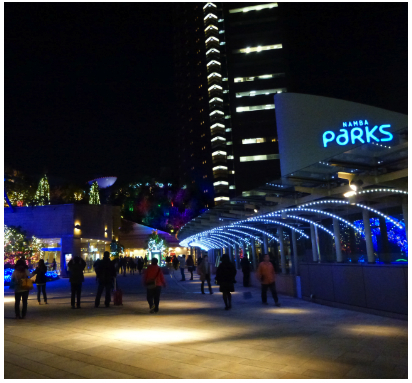 Downtown is a fifteen minute walk away. I’m moving in two and a half weeks. I can’t wait. This tiny apartment has been alright for the past year, but it’s time to move on to bigger and better things! Apartment hunting isn’t so difficult here. There are a number of housing agents who speak English, so it’s alright. …are adorable. I visited a particular kindergarten for the last time last week and after the last lesson of the morning, the kids followed me out of the classroom to ask me a million questions. They asked a lot of questions, all in Japanese of course: “Where are you from?” “What is Canadian food like?” “What Japanese food do you like?” “Where do you live?” “Are there any temples near your home?” “What’s your favourite colour?” “How old are you?” “Can you play soccer?” As an English teacher there, I’m not supposed to speak any Japanese around the children, so I responded in English, though whether I could’ve answered in Japanese had I been allowed is questionable. I’m always surprised when a group of kids seems interested in me, because I feel so clueless around them most of the time. I’ve become a lot more comfortable with being around large groups of them in the pass year, though. dear diary, last night was fun. One of things that makes it easier to live here is familiarity. I went out last night for the first time in ages. It was a good time. 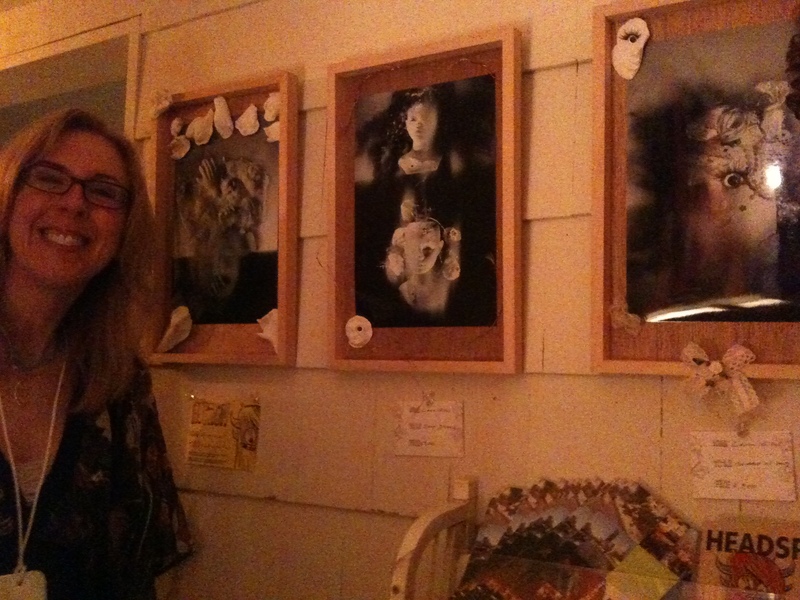 Started off at an art show with my friend Nadine, to see some photographs that our mutual friend Laura had on display. It was a fundraising event for Tohoku earthquake relief, held at a small Mediterranean restaurant downtown. It appeared to be well attended! They had a lot to offer, between the various visual art displays, performance arts, and live painting. The theme was “Monster” and the decor and artwork all suited this. 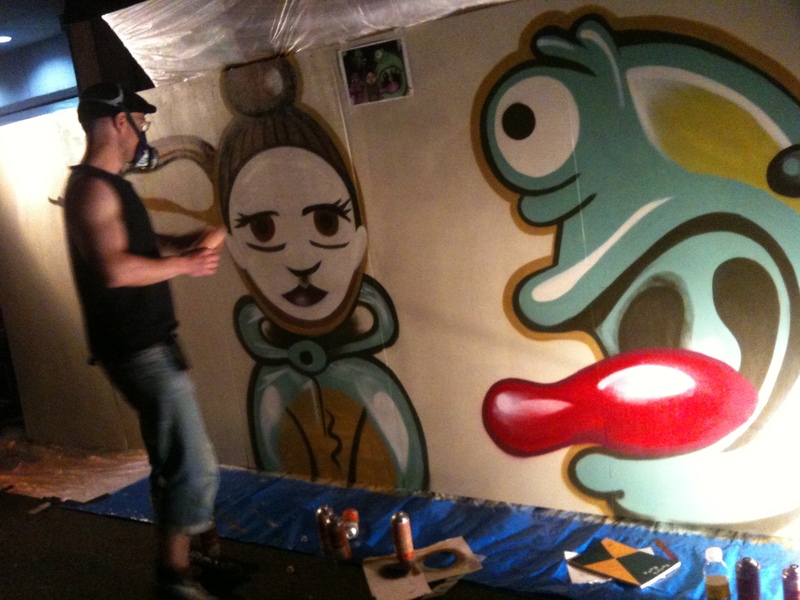 Outside, they had live graffiti art. 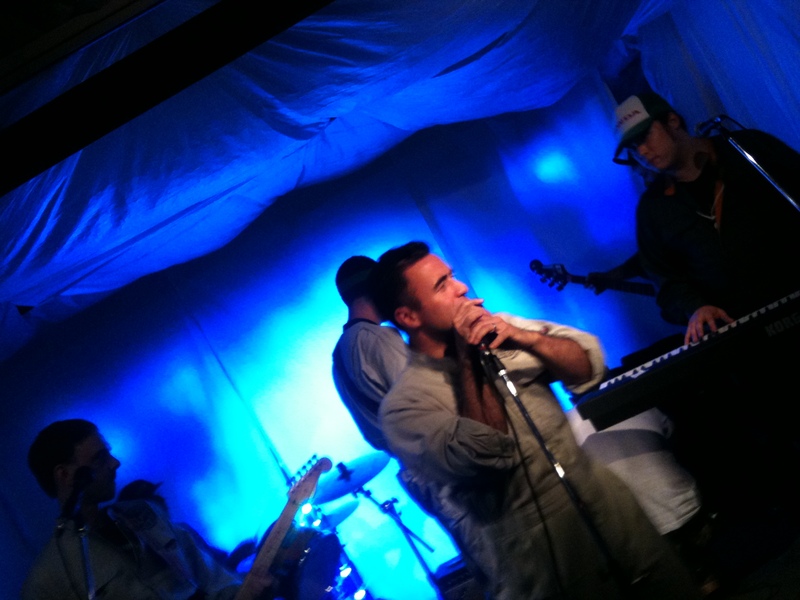 I had seen Union Trouble play before, back in March, and had met their keyboardist on a few occasions before that. Before they went on, a couple of people did a short improv show – I had seen them perform a couple months ago with their improv group, “The Pirates of the Dotombori”. It was fun! Amidst all of this, I ran into a number of people who work for the same company as me. It was a popular place to be. We headed on over to a cafe/restaurant/bar afterwards for a pizza slice and a calzone. I had met the owner of this place a couple months back; he’s from Kitchener, Ontario and his menu reflects that. A decent selection of pizza, wraps, calzones, desserts, milkshakes, sandwiches, and appetizers (including nachos, which I’ve found aren’t that common, and which I miss sharing with friends at the Merch). On top of all this, they even have smores on the menu. I was happy to see that. And then on over to a small bar a couple streets over, where another teacher was meeting people for her birthday, and where I’m holding that poetry reading in a week from Tuesday (!!!!). It was a good time with some good people. It was very encouraging to hear that a random teacher who I’d never met had heard about the upcoming poetry reading through someone else, and was thinking about coming out. I think it’s gonna be a great night! The rest of last night ended with a nice walk back towards home and good conversation with my friend Stephanie. It’s a lot of little things that happened last night that make this place feel more comfortable. Running into friends and acquaintances, seeing that band I’d seen before, or those comedians. Sometimes Osaka seems too big for my liking. I’ve said before: it’s grey, it’s concrete, it’s hard to feel close to anyone at times. Familiarity helps. You are currently browsing entries tagged with Osaka at this is what I never expected to do. .